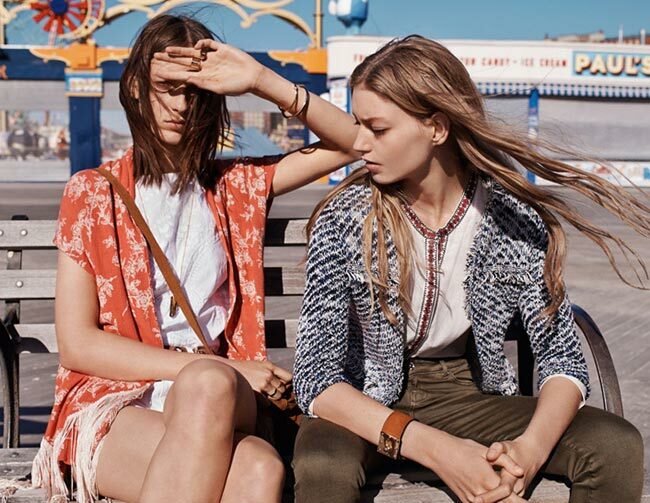 Mango, the clothing design and manufacturing company founded in Barcelona and having taken over the world at this point, is more than ready for the festival season with its 1970s style inspired Mango festival 2015 lookbook. The music festivals are all beginning at this point and the spring season has officially greeted us in some parts of the world. Summer will bring with it even more fun and even skimpier clothes, so looking through what Mango has to offer is a nice bonus from now. Its looks range from long dresses to sheer midi skirts and a few kaftans as well. We know mango is more affordable than many labels, which makes it one of the go-to stores for our festival wardrobes that we have begun to assemble. This particular lookbook stars Ondria Hardin and Julia Bergshoeff, both ranked within the top 50 models and both having walked for many designers on the fall/winter 2015-2016 shows, including Alexander McQueen, Valentino, Chanel, Sonia Rykiel, Givenchy, Celine and such other large brand names. Their currently lookbook is especially appealing, considering the company they are posing for. The ’70s looks are totally in it appears, what with the embroidery on the necks and hems, the fringed satchels, the suede jackets and cowgirl boots. We see leather and we see snakeskin, floppy hats and boho styles. Pants with high waists and leather skirts come into fashion, while oversized knit jackets are draped over the models, bringing back the era that we all love so dearly. What would we have done without the incredibly soft ’70s fashions? The suede miniskirt with the fringes falling from the waist and adding dimension to the look is rather lovely, particularly when paired with a black leather bomber jacket with multiple zips here and there, a black scarf wrapped warmly around the neck and a cashmere floppy ringed hat that protects the head from the sun’s rays while still maintaining its stylish appeal. It’s all about showing off the leg and doing it looking so perfectly like a cowgirl is the best fashion choice you can make. Floppy and cropped jackets are also in style for the festival season, while the snakeskin booties and short cowboy boots with the studding all over make for the perfect footwear this coming season. The shorts are short and the pants in skinny black leather, while the suede and knit jackets ward off the chill that is still in the air. You can wear your hair long or short, in natural boho waves or ironed pin straight. The makeup is minimal and more natural looking, emphasizing the shape of the eyes. Kaftans are gorgeous festival attire, as they are perfect for the days on the beach, at the pool or just walking about town. Kaftans with embroidered necklines and hems are even more beautiful, particularly when they come in matching satchel purses that are full of fringes and made of suede. The look is lightweight and leggy, the perfect outfit for any outdoor music concert event. Keep the makeup natural, the hair loose and parted from the center, whipping in the wind and training down your back. More importantly, don’t forget to have fun with different colored Kaftans, even if the black will keep you warmer as it attracts the sun’s rays.